Summary: A new Johns Hopkins University study adds further evidence to the link between serotonin and dementia. According to researchers, lower serotonin levels may play a key role in memory decline and drive the progression of Alzheimer’s. Results suggest serotonin loss may be a key player in cognitive decline, not just a side-effect of Alzheimer’s disease. Previous studies from Johns Hopkins and other centers have shown that people with Alzheimer’s disease and severe cognitive decline have severe loss of serotonin neurons, but the studies did not show whether those reductions were a cause or effect of the disease. Results of the new study of people with very early signs of memory decline, the researchers say, suggest that lower serotonin transporters may be drivers of the disease rather than a byproduct. A report on the study, published in the September issue of Neurobiology of Disease, also suggest that finding ways to prevent the loss of serotonin or introducing a substitute neurotransmitter could slow or stop the progression of Alzheimer’s disease and perhaps other dementias. “Now that we have more evidence that serotonin is a chemical that appears affected early in cognitive decline, we suspect that increasing serotonin function in the brain could prevent memory loss from getting worse and slow disease progression,” says Gwenn Smith, Ph.D., professor of psychiatry and behavioral sciences at the Johns Hopkins University School of Medicine and director of geriatric psychiatry and neuropsychiatry at Johns Hopkins University School of Medicine. Serotonin levels that are lower and out of balance with other brain chemicals such as dopamine are well known to significantly impact mood, particularly depression, and drugs that block the brain’s “reuptake” of serotonin (known as SSRIs) are specific treatments for some major forms of depression and anxiety. Smith notes that researchers have tried with limited success to treat Alzheimer’s disease and cognitive impairment with antidepressants such as SSRIs, which bind to the serotonin transporters. But, since these transporters are at much lower levels in people with Alzheimer’s, she speculates that the drugs can’t serve their purpose without their target. The idea for Smith’s study was inspired by the work of co-author Alena Savonenko, M.D., Ph.D., associate professor of pathology, and her colleagues who showed that loss of serotonin neurons was associated with more protein clumps, or amyloid, in mouse brain. To further study serotonin’s role in cognition and neurodegenerative disease, the Johns Hopkins research team used brain positron emission tomography (PET) scans to look at levels of serotonin in the brains of people with mild cognitive problems, which may be early harbingers of Alzheimer’s disease or other dementias. For the study, the researchers recruited participants with community newspaper ads and flyers, as well as from the Johns Hopkins Memory and Alzheimer’s Treatment Center. They paired 28 participants with mild cognitive impairment to 28 healthy matched controls. Participants were an average age of 66 and about 45 percent were women. People with mild cognitive impairment were defined as those who have a slight decline in cognition, mainly in memory in terms of remembering sequences or organization, and who score lower on tests such as the California Verbal Learning Test, which requires participants to recall a list of related words, such as a shopping list. According to Smith, the inability to do this test accurately reflects changes in memory and cognitive impairment indicative of Alzheimer’s disease. Each participant underwent an MRI and PET scan to measure brain structures and levels of the serotonin transporter. During the PET scans, participants were given a chemical — similar in structure to an antidepressant but not a high enough dose to have a pharmacological effect — labeled with a radioactive carbon. The chemical binds to the serotonin transporter and the PET scanner detects the radioactivity. When a neuron sends a message it releases the neurotransmitter serotonin, which is detected by the next neuron receiving the message. After this nerve impulse transaction completes, the serotonin transporter SERT grabs up the serotonin and carts it back into the message-sending cell, a metabolic process marked by the ebb and flow of the chemical. 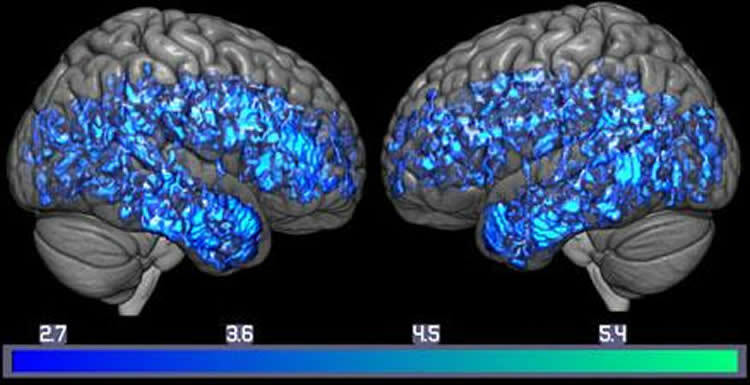 A brain showing decreases of serotonin transporters (blue) in the whole mild cognitive impairment group compared to the whole healthy control group. NeuroscienceNews.com image is credited to Gwenn Smith lab. The researchers then compared the results from the brain imaging tests for the serotonin transporter to those two memory tests, and found that the lower serotonin transporters correlated with lower scores. For example, those people with mild cognitive impairment had 37 percent lower verbal memory scores and 18 percent lower levels of SERT in the brain’s hippocampus compared to healthy controls. Smith says her group is investigating whether PET imaging of serotonin could be a marker to detect progression of disease, whether alone or in conjunction with scans that detect the clumping protein known as amyloid that accumulates in the brains of those with Alzheimer’s disease. When it comes to targeting the disease, because of reduced levels of the serotonin transporters, Smith says, the receptors that detect serotonin on message-receiving cells might be a better option. There are 14 types of serotonin receptors that could be used as possible targets. She says a number of experimental drugs now in clinical trials are designed to target serotonin in other ways in the brain, and may have better success than the SSRIs. About 5.5 million people in the U.S. have Alzheimer’s disease-caused dementia, and that number is expected to rise with the increasingly aging population. Funding: The study was funded by grants from the National Institute on Aging (AG038893 and AG041633) and the National Center for Advancing Translational Sciences (UL1 TR 001079). Image Source: NeuroscienceNews.com image is credited to Gwenn Smith lab. Johns Hopkins University “Lower Brain Serotonin Levels Linked to Dementia.” NeuroscienceNews. NeuroscienceNews, 14 August 2017. Johns Hopkins University “Lower Brain Serotonin Levels Linked to Dementia.” http://neurosciencenews.com/serotonin-levels-dementia-7293/ (accessed August 14, 2017). Neuropathological and neuroimaging studies have consistently demonstrated degeneration of monoamine systems, especially the serotonin system, in normal aging and Alzheimer’s disease. The evidence for degeneration of the serotonin system in mild cognitive impairment is limited. Thus, the goal of the present study was to measure the serotonin transporter in vivo in mild cognitive impairment and healthy controls. The serotonin transporter is a selective marker of serotonin terminals and of the integrity of serotonin projections to cortical, subcortical and limbic regions and is found in high concentrations in the serotonergic cell bodies of origin of these projections (raphe nuclei). Twenty-eight participants with mild cognitive impairment (age 66.6 ± 6.9, 16 males) and 28 healthy, cognitively normal, demographically matched controls (age 66.2 ± 7.1, 15 males) underwent magnetic resonance imaging for measurement of grey matter volumes and high-resolution positron emission tomography with well-established radiotracers for the serotonin transporter and regional cerebral blood flow. Beta-amyloid imaging was performed to evaluate, in combination with the neuropsychological testing, the likelihood of subsequent cognitive decline in the participants with mild cognitive impairment. The following hypotheses were tested: 1) the serotonin transporter would be lower in mild cognitive impairment compared to controls in cortical and limbic regions, 2) in mild cognitive impairment relative to controls, the serotonin transporter would be lower to a greater extent and observed in a more widespread pattern than lower grey matter volumes or lower regional cerebral blood flow and 3) lower cortical and limbic serotonin transporters would be correlated with greater deficits in auditory-verbal and visual-spatial memory in mild cognitive impairment, not in controls. Reduced serotonin transporter availability was observed in mild cognitive impairment compared to controls in cortical and limbic areas typically affected by Alzheimer’s disease pathology, as well as in sensory and motor areas, striatum and thalamus that are relatively spared in Alzheimer’s disease. The reduction of the serotonin transporter in mild cognitive impairment was greater than grey matter atrophy or reductions in regional cerebral blood flow compared to controls. Lower cortical serotonin transporters were associated with worse performance on tests of auditory-verbal and visual-spatial memory in mild cognitive impairment, not in controls. The serotonin system may represent an important target for prevention and treatment of MCI, particularly the post-synaptic receptors (5-HT4 and 5-HT6), which may not be as severely affected as presynaptic aspects of the serotonin system, as indicated by the observation of lower serotonin transporters in MCI relative to healthy controls.